MARIUPOL, Ukraine -- Fighting in Ukraine has killed more than 6,600 people. 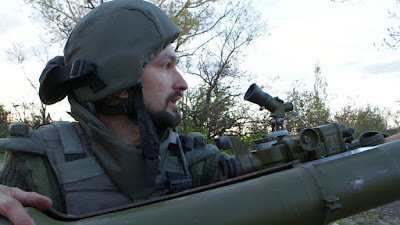 Filmmaker Patrick Wells travelled to south east Ukraine and got unprecedented access to forces on both sides of the ceasefire line. 18 months into the civil war in Ukraine and there is no end in sight, writes filmmaker Patrick Wells. I spent three weeks filming on both sides of the front lines outside the strategic southern port of Mariupol - a vast industrial city that's the gateway to Crimea. The conflict may have dropped down the international news agenda, but bitter fighting continues...and the levels of hatred on both sides of the divide are escalating as the two sides become increasingly distant from one another, and increasingly polarised. Movement across the front lines without a press pass is tightly controlled. These days all the opposing sides see of the other is incoming shelling, propaganda on TV and insults shouted across no man's land. As much as it's a shooting war, the conflict in Ukraine is also a media war: a war for possession of people's minds. Participants who once had normal lives are now mired in disinformation, and much of what they think they know about their enemy is wrong. The separatists broadly, and falsely, believe they are protecting the east of the country against a fascist junta that has come to power in Kiev. Likewise, many government volunteers I met thought the separatists were all paid mercenaries or terrorists: but Jack, the separatist soldier I filmed, had a wife and small baby to feed, no money and a fridge full of rotting veg. Jack said he joined up because of the number of civilians he saw killed by indiscriminate shelling in residential areas. His mother's kitchen windows were smashed by shrapnel in January. He says anyone who has studied history can say neither the Soviet Union nor Russia has ever attacked anyone. The Slavic nationalist worldview owes much to years of Soviet-era influenced history lessons and outright propaganda on television. But right or wrong, it's clear that he and many of his comrades believe in what they're doing. Far beyond the differences across the divide, what sticks in my mind are the similarities between the soldiers on the two sides facing each other down. The fighters I met opened their worlds to me. I filmed them in combat and at home with their families, both wrestling with the crushing dread and uncertainty that war brings. Their mothers said goodbye to their sons, unsure of whether they would see them again, spending their days glued to the news, looking for clues as to their children's fate. At first they counted the days their sons were away. Now the days have turned into months, and the months are turning into years.